Flat UI is made using popular twitter bootstrap. So it is an advanced design framework built using twitter bootstrap in flat style with plenty of new and cool features that needs for a most modern website. If you are designer, you can also grab PSD version of the same Flat UI kit. If you have twitter bootstrap based website you can easily switch to a neat flat design using this kit from designmodo. As I told earlier flat ui html framework is coming with plenty of cool features. Here it is some features that will help fast and neat web development. Bootstrap design will help faster development of website, we can easily create any kind of layout using twitter bootstrap. Grid system, bootstrap will help us to easily re-use css and html. Bootstrap is coming with some necessary jQuery plugins, that should definitely help to produce better user-friendly web apps. 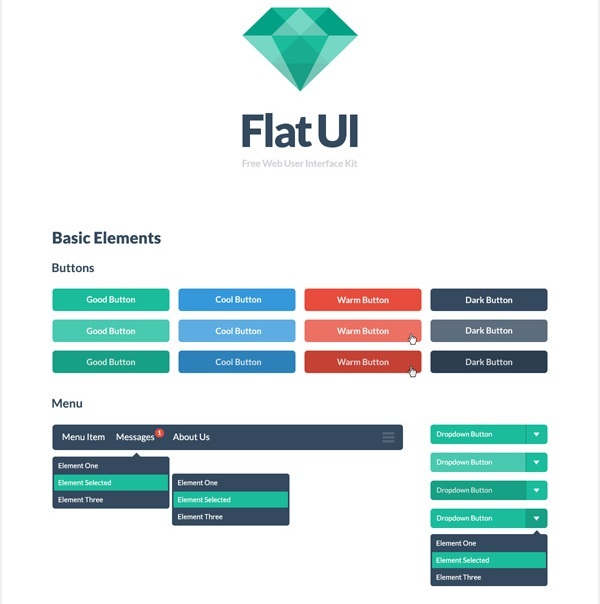 Flat UI is fully responsive which will give consistent user experience in most of the devices. Flat ui is retina ready so icons will look clean in retina ready devices. Before buying premium version of flat ui you can try the free basic version. It is also coming with plenty of features Download free version. There are some nice WordPress themes which is making use of flat design. Flatpress from Bragthemes is a nice implementation of flat ui in WordPress. If you love WordPress and need a flat design based WordPress theme Flatpress is the right choice.